This is a famous performance, not just in the annals of this symphony but among Mahler performances and recordings generally. It was issued by BBC Legends in 1998 and reviewed with unalloyed enthusiasm by Tony Duggan. Tony also commented on the recording in detail in his synoptic survey of recordings of this symphony. I strongly commend his views on this recording. I don’t know how widely available that BBC Legends issue is nowadays but Andrew Rose has given the recording a new lease of life through his XR re-mastering process. This was a milestone concert for which 755 performers were assembled – not quite the’ Symphony of a thousand’ but not far short. Incidentally, we get that statistic from the spoken introduction to the BBC broadcast by Deryck Cooke. You can hear that on the Pristine website: what a pity it couldn’t be included on their re-mastered recording. Andrew Rose says in a note that the BBC relayed the concert in experimental stereo, using a single stereo microphone set-up. It should be remembered that this took place quite some time before the installation of the “flying saucers” high above the auditorium, which tamed a good deal of the cavernous resonance in the Royal Albert Hall. I’ve owned the BBC Legends transfer for many years. Their booklet note is an essay by the conductor Bernard Keeffe, which gives some fascinating information about the background. Nowadays opportunities to hear Mahler’s Eighth are more frequent than used to be the case but Keeffe points out that prior to this 1959 performance the symphony had only been given on three previous occasions in London. This particular concert came about thanks to a very large slice of luck. Keeffe relates that in 1958 Robert Simpson, then a senior BBC music producer, persuaded the BBC to mount a Mahler symphony cycle in 1960 to mark the centenary of the composer’s birth; Keeffe was asked by Simpson to “look after some of the performances.” The slice of luck came in October 1958 when the Controller of the BBC Third Programme discovered that he was likely to have a substantial surplus on his financial budget for the year 1958/59. It was politically expedient for him not to underspend it. To help him get rid of the spare cash he turned to the music department who were, as Keeffe charmingly puts it, “top of the league among big spenders”. It was quickly decided to try to spend the windfall on presenting Mahler’s Eighth. The only snag was that the cash had to be spent before the end of the financial year on 31 March 1959. To cut a long story short, they were able to book Horenstein and also secure a free date in March 1959 at the Royal Albert Hall; then preparations began to execute this mammoth musical project in less than five months. Incidentally, Horenstein asked for the composer and conductor Berthold Goldschmidt to lead the musical preparations in London. With eleven days to go before the end of the financial year the performance took place. Among the constraints was that the Albert Hall was not free for a general rehearsal prior to the concert; instead this took place in the concert hall of the nearby Royal Academy of Music with everyone somehow squeezed in. Thus when Horenstein came out onto the Royal Albert Hall stage – to conduct the symphony for the very first time in his career, remember – he had had no opportunity to rehearse the vast ensemble in situ, let alone to balance it. As regards balance it must have been a question of adjusting as the performance progressed. How scary. I’m pretty sure that the lack of a rehearsal in the hall itself explains the occasional imprecisions of ensemble. It’s noticeable that these imprecisions occur mainly in Part I; clearly as things proceeded everyone became increasingly accustomed to the conditions. To be honest, I’m astonished that such a complex score could be as well performed as is the case here when one reflects that the performers were contending with a large, very resonant space – and, for many of them, a significant distance from the rostrum – for the very first time. As I said, it’s not perfect but one can easily overlook the occasional awkward moment because the performance has such conviction and energy; really, it goes very well indeed. In Part I the passage that begins at ‘Accende’ is very exciting and the listener gets a very real sense of a large ensemble performing in a vast auditorium. The tumultuous ‘Gloria Patri Domino’ sweeps all before it even though Horenstein is very sensible in his pacing of these last pages. The long orchestral opening to Part II is well done; my goodness, the playing is passionate at times. The soloists were placed to the right and it doesn’t sound as if they were at the front of the platform; they seem to be at some distance from the microphones. Though all do well there are moments when both the baritone and bass are at risk of being overwhelmed by the orchestra during their solos. The Australian tenor, Kenneth Neate (1914-1997) is heroic of timbre in his extended solo ‘Höchster Herrscherin der Welt’ and later Agnes Giebel is radiant as Una Poenitentium. The orchestral episode – strings, harp and harmonium - immediately after Neate’s solo is skilfully balanced by Horenstein. He also shapes with great sensitivity the magical orchestral passage that leads into the Chorus Mysticus – is the clarinettist Gervase de Peyer, I wonder? The massed choirs sing ‘Alles Vergängliche’ marvellously – the hush they achieve is spine-tingling and the roof-raising conclusion of the symphony is overwhelming; small wonder an ovation erupts immediately after the last chord. So, despite some imperfections it’s a notable performance and it represents a significant achievement by all concerned, not least by Horenstein who inspires his forces and keeps them on the straight and narrow. What of the recording? The BBC engineers did a pretty remarkable job – and, remember, just like Horenstein, they had one chance to get it right; the lack of a general rehearsal gave them no opportunity to try out the broadcasting set-up prior to transmission. Andrew Rose has transferred the recording with his usual expertise. However, I did a lot of sampling of the Pristine transfer alongside the BBC Legends effort and while the new transfer is better I didn’t find that the differences between this new transfer and the pretty good BBC Legends version were all that great. The Pristine has rather more definition and impact; the sound is clearer than on the previous version and the bass is somewhat fuller. However, the BBC Legends transfer is far from superseded. If you already own that version I think you can rest content. One advantage that the BBC Legends version enjoys is that the symphony is split into 21 separate tracks; disappointingly, each of the symphony’s two parts is contained on a single track in the Pristine incarnation. The BBC Legends issue of this performance included as a “filler” a most interesting conversation between Horenstein and Alan Blyth. Pristine give us three Wagner pieces which were recorded under studio conditions. The producer of these recordings was Charles Gerhardt while the engineering was the responsibility of Decca’s Kenneth Wilkinson. In re-mastering these recordings Andrew Rose has been able to correct a significant flaw in the recording of Siegfried Idyll; the pitch dropped quite a lot during the performance but Mr Rose has rectified that. The performance of the overture to Der fliegende Holländer is taut and turbulent. By contrast Siegfried Idyll receives a tender, flowing performance, which is played with no little delicacy. In between comes the Bacchanale from Tannhäuser. This is not by any means my favourite Wagnerian “bleeding chunk” and it seems distinctly odd to hear it in isolation. However Horenstein drives the music forward with spirit. Incidentally, I found that after playing the Wagner pieces I had to turn up the volume for the Mahler. This is another invaluable example of the art of Jascha Horenstein from Pristine. 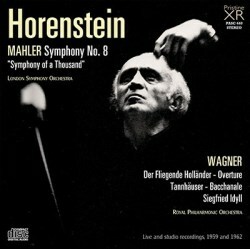 If you haven’t already heard this 1959 account of Mahler’s Eighth I urge you to do so. Andrew Rose’s transfer conveys the stature of this reading extremely well.